Although you’d never know it from following the mainstream media, there are big plans afoot for this year’s May Day. 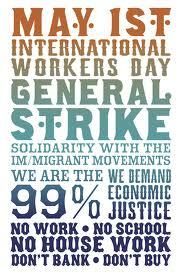 The global General Strike of the 99% called for May 1 is gaining steam as we move into the final days of preparation. It’s going to be big. It’s going to be loud. It is meant to be an unsettling reminder to the 1% of how much their privilege depends on the cooperation and docility of the 99%. What if everyone just decided to go on strike with their credit card interest payments? Their student loan interest payments? Their mortgage interest payments? What if everyone decided to redirect their energies to revitalizing local economies, forming their own credit cooperatives, issuing their own currencies, reinstating barter and time banks, growing their own food? What if everyone just opted out of the huge, unwieldy and oppressive structures that corporate globalization has imposed on us? 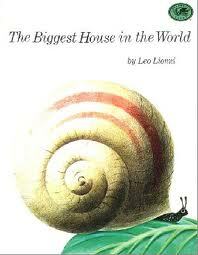 I am reminded of the Leo Lionni story about the snail who was so entranced with his creative power to build an ever bigger and more intricate shell that eventually he was pinned down by the enormous, gaudy fruits of his labors and had to abandon that monster shell and start anew, humbly admitting that bigger was not better. Collectively, and with Americans in the lead, human civilization has created a monster that now holds us captive. Collectively, we can work together to shift course and rebuild a more humane society where the wealth we generate with our creativity and hard work is shared fairly and is not used to destroy our beautiful planetary home. It is true that the Obama administration has tried to move things in this direction, in important areas like health care and finance reform. I believe Obama’s heart is in the right place, but he is held captive like all the rest of us by a rigid system created by the 1% to pander to the 1%. When even our Supreme Court has been coopted to represent the super-elite above the vast majority of Americans, as was quite evident in the Citizens United decision, it becomes clear that working through the system is like swimming in place, swimming against an overwhelming tide. So we need to try something different. We are essentially at the same breaking point our American founding fathers were at back in the 1770s, when they knew that the only way they could move forward was to get the King’s boot off their necks—and the only way to do that was to fight. I don’t want to see another armed revolution or civil war on American soil. I am a pacifist through and through. That’s why I support the concept of the General Strike as a peaceful way to withdraw from the system and remind the elites that the gears of their privilege won’t turn without the grease of our labor and cooperation. This is a fantastic idea – the first I have heard of it…. Try and have a zero carbon footprint just for a day! If this were to be achieved by significant numbers of people (and its purpose made clear in advance), I feel certain it would be taken note of. We might even be able to make the stock markets crash but, if so, try not to worry about your pension; the markets will recover (they always do?)…! As an Aussie I just wish it would morph into a global action. Imagine!! Collectively we could exhert such power, with out recourse to violence. How can we send it viral? Hit the Twitterlines, folks! Get out your Facebooks! Utopia.. nice in theory, deadly in practice. Would be nice if anyone marching today would just sit down for 10 minutes, read the Constitution (probably for the first time), and realize that it is the answer to ALL of their prayers – and it’s already the law.